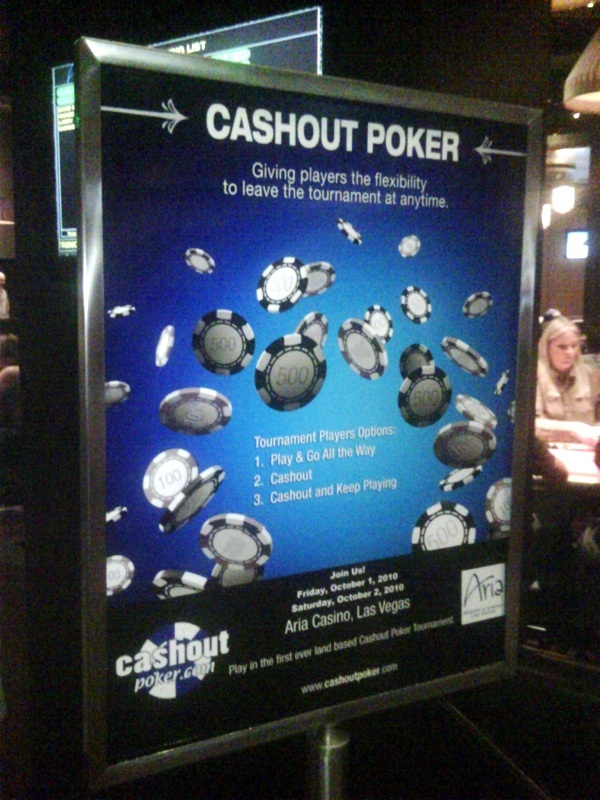 Check it out … caught my eye the other night … Cashout tourneys. Though I’m not sure if they’ll be a regular thing, they made their debut this past weekend @AriaPoker. Interesting concept — essentially tournaments with pre-established guaranteed chops, allowing players to cash out at any point (and go home) … you know, should they not like their chip situation, have somewhere else to be, be on tilt from incessant angry wife texts … whatever … backer with a gun? Apparently they also can cash out and keep playing, too. Full Tilt began offering these online a while back, but no clue how they worked out. According to the sign, these were the first ever in a land-based casino. I ventured over to see how it was playing, but they were down to three and it seemed at this point it was just straight poker. Mel Judah sat at the final table but wasn’t playing. I assumed he was sweating, or at least trying to woo, the lovely middle-age Asian lady still with chips. That may or may not have been true, but turns out primarily Judah was there because it was his game — supposedly his creation. 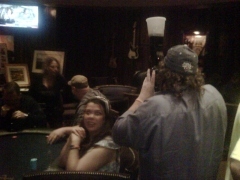 See for yourself what Mel is up to at CashoutPoker.com. UPDATE: Oops, turns out the lovely lady was JJ Liu. One of these days I will learn actual players. Upon his own early elimination, Gavin Smith took over as charity photog, no-flash rules be damned! Also stopped by the Hard Rock this weekend … first time since Detox and the shuttering of their room (and operations) that made @hardrockpoker the Pokerati game’s home for most of 2010. No new-resto construct has begun — just a bunch of tables stuffed in the back of the old room, with their previously decorative orange-luxe highback leather chairs lined up in front of the TVs that used to entertain 1/2 players. With football on and one viewer lounging per screen, It was both awesome and sad. Anyhow, the new smaller spot is still called the “Poker Lounge” … nice-ish, but looks unsettled in. And though it seemed clear from a matter of simple square footage that the Hard Rock’s days as a red-carpet poker venue are gone, none of that seemed to stop the good times at Gavin Smith’s Darius Goes West charity tourney (with Bryan Devonshire) … which was kinda a birthday party for the namesake beneficiary, Darius Weems, the kid with an extra-funky form of muscular dystrophy that Smith says inspired him to a WSOP bracelet this summer. Darius had just turned 21 (he wasn’t supposed to live past 16 I think?) … and really, can you think of a better host to welcome those coming of age into the glorious world of degenerate gambling? BTW, fwiw, the Hard Rock has changed their basic game to 1/3 NL, with a $500 max buy-in. I’m sure Bad Hat out of Tunica will be surprised about this being the first time the Cash Out concept was played in a live casino, and that Mel Judah came up with the idea, as he organized this format maybe over a year ago there. Then again, if it happens in Tunica does it really happen? I played in the cashout tournament on Saturday (busted 8th). 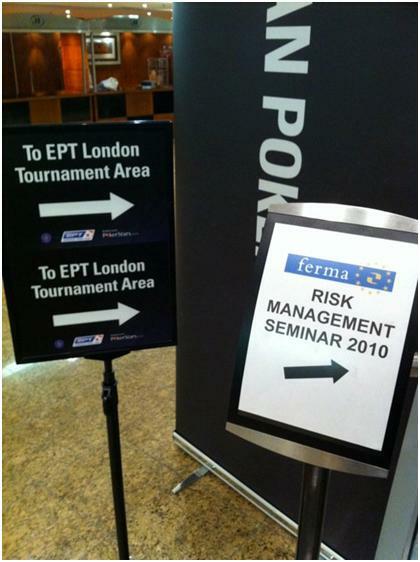 Mel or the Aria tournament staff would have been happy to answer any questions you had about the event. A lot of people seemed to be a bit confused at first about the cashout component, but once it was explained and people had a chance to run through hypotheticals with staff, it seemed to make sense to most people. The middle-age Asian lady you referenced was J.J. Liu. She played in the event to support Mel. I sat with her at three different tables in the latter stages of the tournament, including sitting next to her when we were down to two tables. Their friendship dates back several years. J.J.’s husband would have played in the event were it not for the fact that he had babysitting duties re: their three-year old daughter. lol, carole, very embarrassed … i know JJ Liu, but I just didn’t put the name and face together! JJ is not the first well-known pro I wasn’t able to identify at a table. But now I feel rude for not saying hi! I’m just glad I used all the disclaimers so no one would think I was insinuating anything other than that Mel can be a bit of a cad – even if he wasn’t being one in this situation. (You never seem to highlight my disclaimers – phrasing I learned from lawyers!). I didn’t even realize Mel had anything to do with “cashout poker” until after i got home and looked up the website … then suddenly his presence made sense. I wasn’t even aware the tourney was going on until I showed up @ariapoker. And as mentioned, it was down to three players … I watched a few hands and realized all the cashing out was probably done, so I just put my name on the half-and-half list and took a seat for some 1/3. Figured I could find out more at a future cashout tourney. So btw, did you end up cashing out along the way? I think it’s a pretty good concept … liked the cash out and keep playing option. Now if only they can figure out how to do Rush Poker live. so how does club fortune do their jackpot drop in a better way? what i hate is the way so many rooms now take $2 instead of $1. $4 on $20 really kills any possibility of beating the rake, risking ur $10 to win only $6.